You're the man, Scion tc Release Series 5.0! You totally should've seen how much you drank last night. Do you remember anything after passing out? You beastmanned those brews, homie. I can't believe you were drunk enough to wear those matte black 18-inch wheels and that even blacker paint to the party. You don't remember that? Ha, that's not the end of it. You stopped by the shop and picked up those drop springs, a rear sway bar, TRD exhaust and some gnarly badges. You dropped some serious coin, man. After it's all added up, you're about $2,300 poorer. That's a lot of busing tables. It's not like you didn't know this was coming - this is like the fifth time you've had a blowout like this. Your dancing up on the bar was so popular you've got 2,000 of your friends doing the exact same thing. Righteous. TORRANCE, Calif., Feb. 9, 2009 — Scion, of Toyota Motor Sales, U.S.A., Inc., announced today that the only limited-production tC for 2009, the tC Release Series 5.0 (tC RS 5.0), will have a Toyota Racing Development (TRD) theme and be available at dealer showrooms in March. The 2009 tC RS 5.0 will be on display in the Scion space at the Chicago Auto Show, February 11-22, for media and public days. The 2009 tC RS 5.0 features gloss black exterior paint and numerous performance products from TRD. 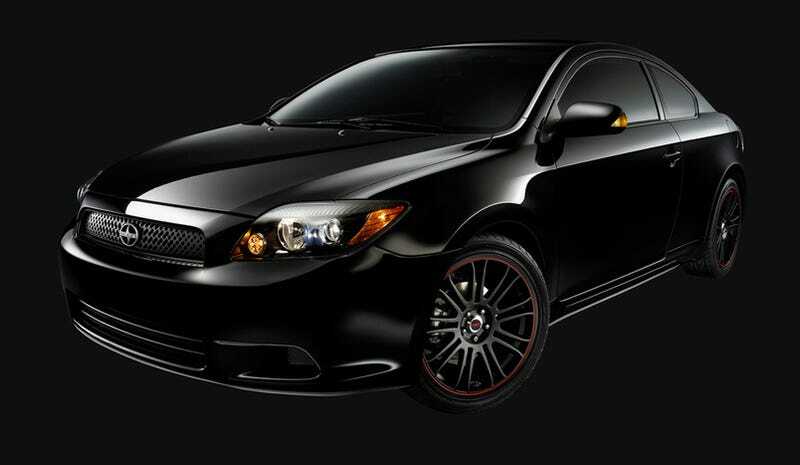 TRD edition 18-inch multi-spoke alloy wheels, in matte black with red trim, and red TRD lowering springs provide this tC with its menacing presence. For additional stability when cornering, the tC is fitted with a red TRD rear sway bar. A TRD sport muffler gives the tC RS 5.0 an aggressive sound signature, while a TRD exterior badge marks the car. A black rear lip spoiler will also be available. The TRD theme is continued inside with a black leather steering wheel featuring red stitching, black seats with red accents and floor mats with the TRD logo. The tC RS 5.0 is also equipped with a cargo mat. Individually numbered badging completes the uniqueness of this vehicle. Only 2,000 units of the tC Release Series 5.0 will be built. The tC RS 5.0 model will carry a manufacturer's suggested retail price (MSRP) of $2,300 over the base price of the tC. The base MSRP for the standard tC with a manual transmission is $17,000, while the standard tC with an automatic transmission model carries a MSRP of $17,800. The available black spoiler has a MSRP of $285, not including installation. Scion tC Release Series 5.0, you rule. Same time next week?